In the modern bus system of Metro Manila, double decker buses might become a common sight. 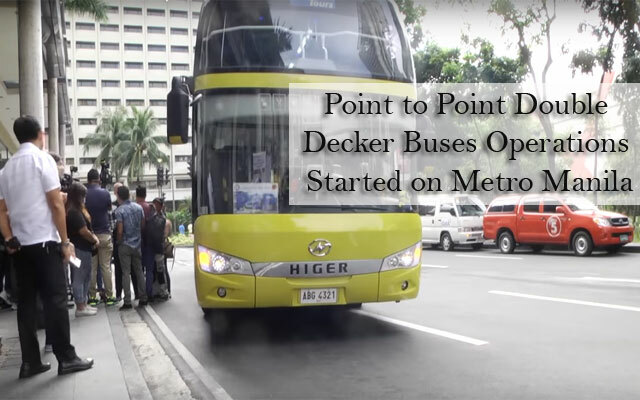 A dry run of the point-to point (P2P) decker bus service has been done last January 7, 2016. This is a part of the ongoing non-stop bus service offered to commuters last month. The double decker bus, operated by Froehlich Tours, was showcased on the non-stop route travelling from SM City North EDSA in Quezon City to Glorietta 5 in Makati City. It is airconditioned and has a VIP lounge and a lavatory onboard. It is also secured with CCTV cameras and has a free WiFi onboard. The P2P system would make for a faster and more comfortable travel time for commuters in EDSA because buses under this sytem would no stop along its route, thus saving upto thirty minutes travel time. The seats are also guaranteed for passengers. The departure of the said buses is fixed, whether or not the vehicles are full. However, this system does not guarantee that it would avoid accumulating travel time due to heavier that usual traffic. During the morning dry run, the double decker bus departed Quezon City terminal at exactly 8 am and arrived at Glorietta 5 in Makati City at 9:15 am. The distance was 14.9 km and it took 75 minutes. Nonetheless, the passengers of the maiden trip was satisfied with the results because according to them, they would usually travel for 90 to 120 minutes on the same route. It was also an advantage that the ride was very comfortable. The P2P service is currently operating along three routes in Metro Manila but it is planned to be expanded. The LTFRB is currently in the process of selecting bus operators for additional routes linking Makati, Ortigas Central Business District, Alabang and Fairview starting June 2016. Operators should meet requirements like buses equipped with an automatic fare collection system, GPS devices, CCTV cameras and free WiFi. They should also comply with Euro Iv emission standards or better.